Attention Cat Owners in Idaho and Oregon: If your feline friend is suffering from Hyperthyroidism, WestVet offers I-131 radiation therapy that will enable your cat to live a healthy, happy life. We are delighted to share a story published in the Urban Liaison this summer featuring our own Dr. Hazel Carney. This story was written by Christy Hovey. In 2002, Elaine Gie was ready for a change for herself and her three cats. The Texas native visited Boise and fell in love with our climate and the beautiful landscape. That summer she moved to Idaho with her cats, Kittywell (age 12), Tiger (age 11), and Miss Cleo (age 7), to “escape the heat, humidity, and relentless traffic issues associated with living in Houston.” One year later, Kittywell was diagnosed with feline hyperthyroidism. 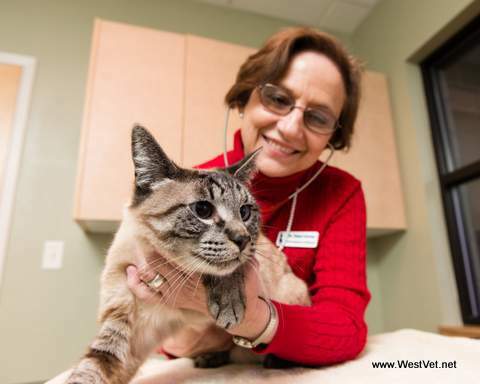 He was referred to Dr. Hazel Carney, Feline Medicine and Behaviorist specialist at WestVet, for I-131 radiation treatment. Feline Hyperthyroidism causes numerous metabolic changes in cats including weight loss, fluctuations in appetite and energy level, fever, rapid heartbeat, excessive water intake, diarrhea, and osteoporosis. Dr. Carney is a nationally recognized veterinarian who co-created I-131 radiation treatment in 1986. Elaine says, “Kittywell was an easygoing cat who could jump large heights, even in his senior years. He had experienced a heart murmur while living in Houston, so Dr. Carney took extra precautions.” During his treatment, he developed an extremely rapid heartbeat and Elaine believes that without Dr. Carney’s expertise, his heart might have given out. She administered medication to slow Kittywell’s heart and help him through the I-131 treatment—which was 100% successful in curing his hyperthyroidism. Elaine’s tortoiseshell tabby female, Tiger, also reached age 19 under Dr. Carney’s care. Just like Kittywell, Tiger was diagnosed with hyperthyroidism and treated in 2004. Tiger developed a myriad of health issues related to chronic renal insufficiency and Dr. Carney not only coordinated treatments with her family veterinarian, she also recommended holistic treatments such as non-prescription supplements that were beneficial to Tiger without added side effects. r cats’ long and happy lives to the attention and consideration that Dr. Carney showed toward her feline family. “I’m very happy to have Dr. Carney involved in the care of my cats. No one else has her in-depth knowledge of feline health, especially for geriatric cats, and no one else has the deep regard and appreciation for cat behavior that Dr. Carney demonstrates on a regular basis.” Pictured above, Dr. Carney with her cat, Wyatt.